This post’s TUNE comes from Mr Dizzee Rascal. Who doesn’t love a good bit of rap! Especially a good British one! Back in the day when this tune first come out Dizzee was more of a rarity as a British rapper, however, now days he’s joined by plenty of other UK talent, Tinie Tempah being a fine example! Anywho, this song is just so cool, and since then Mr Rascal has kept his standards very very high, all of his songs could have easily been used here but I thought I’d start with one of the ones that began it all! You can check out the video here, and visit his website here. Oooooooooooooooooiiiiiiiiiiiiiiiiiiiiiiiiiiiiiiiiiiiii! Lets have a look at an outfit is it?! My new necklace goes lovely with it, and just so I can go outside and not freeze to death I put my leather jacket on top. The faux fur is something I bought from HandM a while ago and just haven't worn, the poor thing has been sitting pretty in my wardrobe all this time! It goes beautifully with my jacket and keeps me lovely and warm! So they were right, it's snowing! It seems like everyone is on a snow day today apart from me, one of the drawbacks of living so close to work I guess boooooo! Although I am determined to go for a little walk and enjoy the snow later! Not just nice but neccessary! I love it when it snows, everything looks so pretty! Looks great hun, love the faux fur with it, it brings the outfit all together. Your dizzee comment made me smile, reminds me of my old teenage years lol, xoxo. That dress is perfect with that jacket and faux fur! Great outfit! Very cool outfit. I like your faux fur. Don't worry about working, I am also. Gazing out the window like a little child mind! Great read ! I also picked this dress up in the sale!! And my H&m fur lives wrapped around my leather jacket. That dress is lovely. I love colored lace and you really wear it well. Love this outfit, the collar is so cute and cozy! omg... you look... AMAZING i love your out from from head to toe! Love the burgundy lace dress. Its super cute! I love the faux fur too!!! Fix Up Look Sharp is one of my favourite songs I always listen to it when I'm feeling nervous about something and it makes me feel cooler :) although admitting that makes me feel less cool. Thanks for the comment on my blog lovely! This is a really cute and simple.. got to love the sales! thanks for visiting my blog :) followed yours. Love the faux fur, very luxurious! I love that lace dress, amazing color!! love the lace dress! xO! Stunning :) I love the dress-especially seeing as its lace and purple!! Also Dizzee Rascal cheers me up anyday. Omg that jacket is stunning!! Love that outfit, especially the jacket! I love your outfit!! && Your blog is amazing!! Super cute outfit! Thanks for stopping by my blog. I'm following you on Bloglovin now. Love your dress looks gorgeous! love your new dress! And so lucky that you were able to find it on sale, I love a good bargain. Wow ,beautiful ,classy Outfit! Love the Pictures ,you look fabulous! That dress is so cute! I simply love the color and the lace. 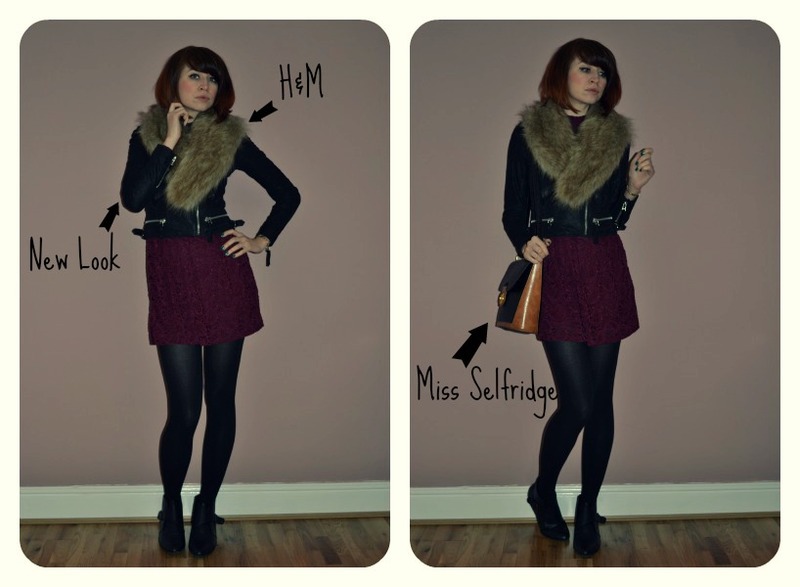 This is such a lovely outfit and what a bargain the dress was :) I often wear my faux fur over my leather jacket too! You look gorgeous! That dress was a bargain in the sale, lucky girl! That dress is gorgeous and on sale... wow!! Loving your blog!!! :) Let me know if we should follow each other. i love this outfit and your blog banner! I love the post and lovely outfit. I love the colour of the dress- bang on trend. Love topshop too. Wow, that dress and fur scarf are fab!!! I really like this Pinot-Noir-red lace dress! The colour is amazing and I just love how it looks on lace. The faux leather jacket thoughens up this outfit just perfectly. Lace skater dressed, good choice! Absolutely love them!!!! The colour of this one is beautiful. You look great! I love the dress, especially the length of the sleeves. It seems so rare to find a long sleeve on a dress. Can I just say I love your blog layout; you header is immense - LOVE! The faux fur collar looks lovely on you! Thank you for checking out my blog:) I now follow you on Bloglovin!